Maserati is hitting the track again with its GranTurismo MC Corse concept, based on the Maserati GranTurismo S. A full roll cage provides driver protection, while upgraded monobloc brakes, an enhanced suspension and fat 18x12 front and 18x13 rear wheels keep the chassis in check. What's under the hood, you ask? The Maser's powerplant gets a new intake system, competition-spec catalytic converters and retuned exhaust, all of which combine for a healthy 450 HP. Of course, aero additions round out the track-day package to keep the car glued to the pavement. 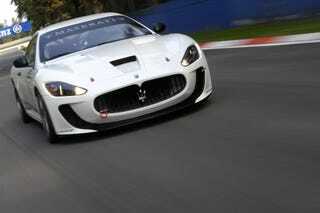 Look for the race-ready Maserati to bow at next month's Paris Motor Show, but enjoy the gallery below in the meantime. (UPDATE: Brochure from Maserati posted below the jump).